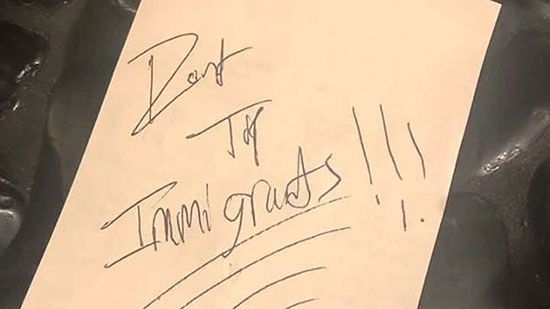 The owner of a Burlington County restaurant is speaking out after a couple left an anti-immigrant message for a multilingual server on the back of their check last week. Santiago Orosco, the owner of Under the Moon Cafe in Bordentown, shared a picture on Facebook of the bill left by a couple who dined there on Thursday evening, 1/24. They had written, "Don't Tip Immigrants," across the back and did not leave a gratuity. Orosco, who is an immigrant himself, said that the couple who appeared to be in their mid to late 40’s "raved about the food, the décor, and the service." He believes that the couple heard the server speaking to another employee in Spanish and assumed she was an immigrant. In fact, she is natural born American citizen who is multilingual, having grown up speaking both English and Spanish in her household. Her family is from Uruguay. Orosco said, "I am utterly shocked at this blatant ignorance." A Delaware County woman has been charged with stealing more than $337,000 from her own mother and using the funds for her own personal and business expenses. 52-year-old Bernadette Branson-Lawler stole a total of $337,715.61 from her 78-year-old mother who is non-verbal and in an assisted living facility. The thefts happened between January 2011 and October 2017. She is charged with theft by unlawful taking, theft by deception, and receiving stolen property. In July 2013, Branson-Lawler petitioned the Orphan's Court of Delaware County to become her mother's guardian. She sold her mother's house for $269,000 and moved her into the assisted living facility. She was removed from the guardianship in October 2017 after she failed to submit the required paperwork. An investigation was launched and found suspicious withdraws. Branson-Lawler admitted to withdrawing money from her mother's accounts for personal expenses, including her interior design business, electric bill, insurance bill, cell phone, gym membership, and also just checks written out to herself. A hearing is scheduled for Feb. 5. If you feel a senior is being taken advantage of don't hesitate to contact authorities. A school bus crashed into a utility pole this morning, 1/28, in Morris County, New Jersey. It happened near Long Hill Road and Meyersville Road in Long Hill around 8:30 a.m. Eight children and the driver were trapped inside following the accident after live power lines fell onto the bus. They were all evacuated a short time later after the power to the lines was cut. No injuries were reported. The children ranged in age from 8 – 11. They were on their way to school in Millington and Gillette. It appears the bus driver lost control while making a left turn. The cause of the crash is under investigation. Tuesday: High 43, Snow starting in the afternoon and overnight. 1" to 2" is likely near I-95 with 2"-4" in the north and west suburbs. 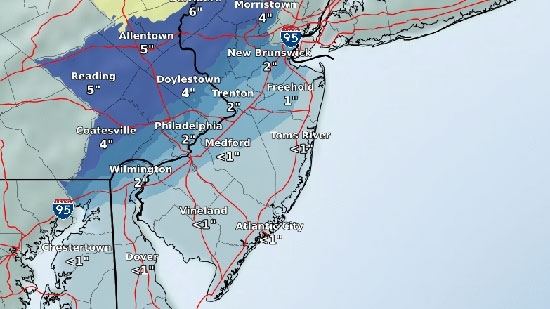 See Snow Map below. Wednesday: Cold and blustery. High 27, single digit wind chills. Thursday: Brutally cold. Mostly Sunny and windy. Morning lows in the single digits with wind chills -10 to -20. High only 15. Friday: Still cold, Morning lows in single digits. High 25. Temperatures start to moderate through the weekend.